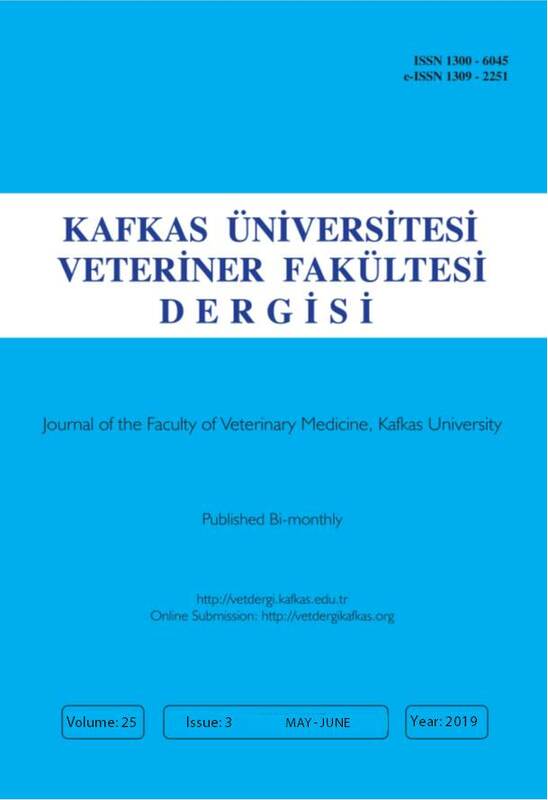 1- Kafkas Universitesi Veteriner Fakultesi Dergisi (abbreviated title: Kafkas Univ Vet Fak Derg), published bi-monthly (ISSN: 1300-6045 and e-ISSN: 1309-2251). We follow a double-blind peer-review process, and therefore the authors should remove their name and any acknowledgment from the manuscript before submission. Author names, affiliations, present/permanent address etc. should be given in the title page only. The journal publishes full-length research papers, short communications, preliminary scientific reports, case reports, observations, letters to the editor, and reviews. The scope of the journal cowers all aspects of veterinary medicine and animal science. obtain approval from the editor before submission of a multi-part manuscript. If submitted, multipart papers can be assigned to different editorial board members and independent outside expert reviewers. It is necessary to load all parts of manuscript are required to be loaded into the online system at the same time. Kafkas Universitesi Veteriner Fakultesi Dergisi is an Open Access journal, which means that all content is freely available without charge to the user or his/her institution. Users are allowed to read, download, copy, distribute, print, search, or link to the full texts of the articles, or use them for any other lawful purpose, without asking prior permission from the publisher or the author. This is in accordance with the BOAI definition of Open Access. Manuscripts submitted for publication should be written in Turkish, English or German. 2- The manuscripts submitted for publication should be prepared in the format of Times New Roman style, font size 12, A4 paper size, 1.5 line spacing and 2.5 cm margins of all edges. The legend or caption of all illustrations such as figure and table and their appropriate position should be indicated in the text. During the submission, the authors should upload the figures of the manuscript to the online manuscript submission system. If the manuscript is accepted for publication, the Copyright Transfer Agreement Form signed by all the authors should be send to the editorial office. 3- Authors must indicate the name of institute approves the necessary ethical commission report and the serial number of the approval in the material and methods section. If necessary, editorial board may also request the official document of the ethical commission report. Original (full-length) manuscripts are original and proper scientific papers based on sufficient scientific investigations, observations and experiments. Manuscripts consist of the title, abstract and keywords, introduction, material and methods, results, discussion, and references and it should not exceed 12 pages including text. The number of references should not exceed 50. The page limit not include tables and illustrations. abstract should contain 200±20 words. Short communication manuscripts contain recent information and findings in the related topics; however, they are written with insufficient length to be a full-length original article. They should be prepared in the format of full-length original article but each of the abstracts should not exceed 100 words, the reference numbers should not exceed 15 and the length of the text should be no longer than 6 pages in total. The page limit not include tables and illustrations. Additionally, they should not contain more than 4 figures or tables. Preliminary scientific reports are short description of partially completed original research findings at interpretable level. These should be prepared in the format of full-length original articles. The length of the text should be no longer than 4 pages in total. Case reports describe rare significant findings encountered in the application, clinic and laboratory of related fields. The title and summary of these articles should be written in the format of full-length original articles and the remaining sections should follow introduction, case history, discussion and references. The length of the text should be no longer than 4 pages in total. The page limit not include tables and illustrations. Letters to the editor are short and picture-documented presentations of subjects with scientific or practical benefits or interesting cases. The length of the text should be no longer than 2 pages in total. The page limit includes tables and illustrations. Reviews are original manuscripts gather the literature on current and significant subject along with the commentary and findings of the author on the particular subject. The title and summary of this manuscript should be prepared as described for the full-length original articles and the remaining sections should follow Introduction, text (with appropriate titles), conclusion, and references. The length of the text should be no longer than 15 pages in total. Invited reviews will be considered for priority publication. 5- The necessary descriptive information (thesis, projects, financial supports etc) scripted as an italic font style should be explained below the manuscript title after placing a superscript mark at the end of title. 6- At least 30% of the references of any submitted manuscript (for all article categories) should include references published in the last five years. References should be listed with numerical order as they appear in the text and the reference number should be indicated inside the parentheses at the cited text place. For indicating references (no alphabetical), 1-4 should be used rather than 1,2,3,4 (If the reference numbers are consecutively 3 and more, dash “–“ should be used rather than comma). References should have the order of surnames and initial letters of the authors, title of the article, title of the journal (original abbreviated title), volume and issue numbers, page numbers and the year of publication and the text formatting should be performed as shown in the example below. If the reference is a book, it should follow surnames and initial letters of the authors, title of the book, edition number, page numbers, name and location of publisher and year of publication. If a chapter in book with an editor and several authors is used, names of chapter authors, name of chapter, editors, name of book, edition number, page numbers, name and location of publisher and year of publication and the formatting should be performed as shown in the example below. Example: Mcllwraith CW: Disease of joints, tendons, ligaments, and related structures. In, Stashak TS (Ed): Adam’s Lameness in Horses. 4th ed., 339-447, Lea and Febiger, Philadelphia, 1988. DOI number should be added to the end of the reference. references. Abbreviations, such as “et al” and “and friends” should not be used in the list of the references. 7- The Latin expression such as species names of bacterium, virus, parasite and fungus and anatomical terms must be written in italic character keeping their original forms. 8- The editorial board has the right to perform necessary modifications and reduction on the manuscript submitted for publication and to express recommendations to the authors. The manuscripts sent to authors for correction should be returned to the editorial office within a month. After pre-evaluation and agreement of the submitted manuscripts by editorial board, the article can only be published after the approval of the field editor and referee/s specialized in the particular field. 9- All responsibilities from published articles merely belong to the authors. According to ethical policy of our journal, plagiarism/self-plagiarism will not be tolerated. All manuscripts received are checking by plagiarism checker software, which compares the content of the manuscript with broad database of academic publications. 10- There is no copyright fee for the authors. 12- Reprints (in multiples of 50) of the article are sent to the authors for free. Authors should add the necessary clarifications about editor//adviser/reviewer’s comments to the cover letter section for each revision.